The fact that President Uchtdorf (can anyone spell that without having to look it up every time? I can’t!) gave a talk in the most recent General Conference titled “Are You Sleeping through the Restoration?” indicates that perhaps we at times feel that way about the gospel of Jesus Christ. We are committed to it 100%. We attend our meetings. We go to church. We read. We pray. We serve. But do we love it? Do we have a passion for it? Do we recognize that we can taken seriously without being serious? I absolutely adore reading descriptions of the character of Joseph Smith. That was a man who knew how to have fun! Dallin H. Oaks described him in the talk Joseph, the Man and the Prophet as someone with a cheery temperament, who delighted in the society of friends, who would play with the people, who “took delight in competitive sports.” He is well known for his love of children, and for shocking others for acting in ways contrary to what they believed a minster should act. 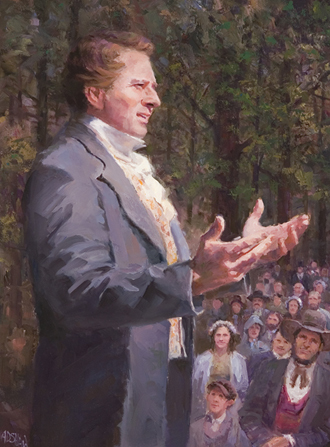 Joseph Smith was an energetic and extraordinarily passionate person, and he was a prophet and fulfilled his duties and responsibilities to the fullest. I imagine that he was someone that I would have loved to be around. I greatly admire his temperament and character. If it’s appropriate for Joseph Smith, a person entrusted by God to restore His gospel on this Earth, it’s appropriate for me! Alma is another person who has a character and temperament full of joy and passion. Although we do not have as detailed descriptions of his character, when I read his writing I can just hear the passion in his voice. Chapters such as Alma 29 are just filled to the brim with eagerness and passion. Captain Moroni, Ammon, Nephi, the scriptures are filled with men whose gospel living is full of emotion. Although I do not have the position or responsibility of either of these two amazing men, I have a strong desire to achieve the same passion. I imagine those who know me personally and know how energetic I am are terrified at the thought that I desire to become even more passionate an energetic about something, but it calls to me. I crave it! How do we follow the example of these righteous brethren and take our commitment and testimony of the gospel and raise it up to passion and excitement for the gospel? How do we become people that love it so much our mortal bodies can’t contain our love for it and it just bursts forth from us? I love this. Joseph Smith is one of my favorite people to ever live! I feel the same as you, I want to achieve the same passion and energy that he did with the gospel and life. Thank you for sharing Amy!